Considered the «king» of fertilizers, it isn’t comparable with similar products becouse of its slow degradability for high presence of compost’s elements. It promote the formation and stability of soil glomerules in long period. 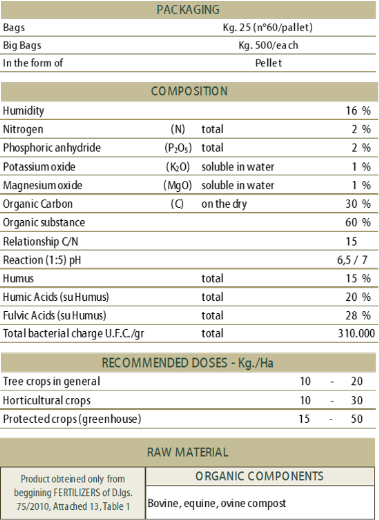 Nutritional effects shown from the beginning and for more years, releasing elements contained, as Nitrogen, Phosphorus, Calcium, Magnesium, Potassium and microelements: so, it’s good to supply manure every year to keep constant benefits of both, as improver and as feed, becoming a true slow realasing fertilizer.